JCS is proud to be certified as a Signamax Authorized Installer. The Signamax Premise Connectivity System enables you to build a network infrastructure that can accommodate all your network operation system -- Ethernet, Fast Ethernet and Gigabit Ethernet applications. 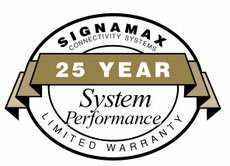 As a Signamax Authorized Installer JCS can offer the 25-Year Connectivity/Cabling System Limited Warranty. Since 1995, Johnson Communications Services, Inc. (JCS), the craftsmen and consultants in voice and data cabling, remain committed to providing high performance, cost effective, industry compliant communications services designed specifically to each client’s needs. The hallmark of all JCS installations has always been great attention to craftsmanship and quality with an emphasis on long term partnerships with our customers. At JCS, it’s more than “the install” – we focus on the “big picture” goals of our customers and partner with you to create and implement plans that support your organization’s communication and business needs now and well in to the future. JCS routinely completes all projects within customer defined schedules and delivers completed projects with ZERO defects. This is our commitment to you! For additional information about JCS and our commitment to top quality project management and installations, please contact us at 913-681-5505 or visit our contact JCS Page. Building the Backbone of Your Company's Communications!